From the Egyptian Book of the Dead to the Book of Revelations, from Homer to Dante, from the Emaki picture scrolls of Japan to the frescos of the Sistine chapel, many cultures across the world and through time have engaged with the question: what happens when we die? Some of the earlier notions of the afterlife, Hades (Ancient Greek) and Sheol (Ancient Judaic) suggest a drab twilight realm where all the dead gather without distinction. But this could be thought to pose a challenge to ethicists: what is the point of living a virtuous life if both the murderer and the victim end up in the same place eyeballing each other through eternity. Over time Hades and Sheol differentiated into two spaces; one a realm of bliss where the deserving were rewarded (the Elysium fields, the Gan Eden, Heaven) and the other, a realm of torment where the wicked were punished (Tartarus, Gehinnom, Hell). There is still oppression in the world but now the virtuous oppressed have something to look forward to, if not in this world, then certainly in the next. Whereas many cultures grappled with the ideas that we would recognise as belonging to the frame of heaven and hell, it is arguable that no other culture engaged with this as vividly and in as much detail as did the medieval and counter reformation culture of Christian Europe. The iconography of the Last Judgement and therefore Heaven and Hell developed during the Middle Ages, supported by sacred texts and the mystical visions of saints, and the last judgement became a common subject in medieval art. 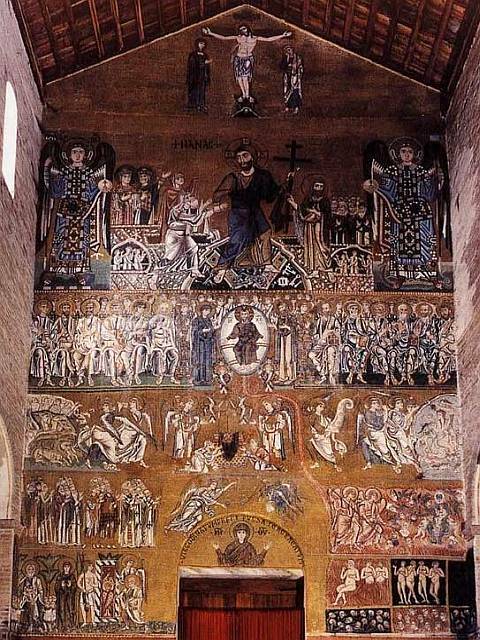 The 12/13th century mosaic at the Cathedral of Santa Maria Assunta in Venice (figure 1 right) shows the main elements of that iconography: a hierarchical space with Christ at the top centre under whom the action is played out; the resurrection of bodies; the moment of judgement; the descent or ascent into Hell or Heaven; the state of eternal bliss or torment according to ones just desserts. There is a common sensibility and perhaps a common purpose to these works: to assure the virtuous oppressed that their time will come while warning them against rebellion and to admonish the powerful and warn against the over exploitation of the weak. Not all the mitres and crowns are shown ending up on the right hand side of Christ. The artistic imagination is harnessed to provide the means by which the virtuous oppressed could be given the vicarious pleasure of seeing their oppressors brought to account. From the late seventeenth century onwards, as the forces of enlightenment gained ground and the energies of the Counter-Reformation fizzled out, so did the evocation of heaven and hell. William Blake and John Martin revived the idea in England in their very different ways in the nineteenth century as part of the Romantic reaction to the perils of materialism and the machine soul. But where is heaven and hell in modern and contemporary art? Apart from oblique suggestions in the odd works such as Mark Wallinger's “Threshold of the Kingdom” and the Chapman brothers' monumental "Hell" (now lost to fire) it seems to have lost relevance to our culture. Would not a medieval European peasant, if she were to look at our brimming supermarkets, our hospitals and clinics, our clean cities and well fed children... would she not think that she was already in heaven? Think how limiting a vision of popular heaven that Pieter Breughel presents in his "Land of Cockaigne", 1567 (figure 2 below). It is essentially three satiated peasants rolling around on the ground in a contented stupor, while around them strolls "ready to eat" food walking on its own legs (a roasted pig with a slice taken out if it walking around with a handy knife, an egg on legs with a knife embedded in its head). 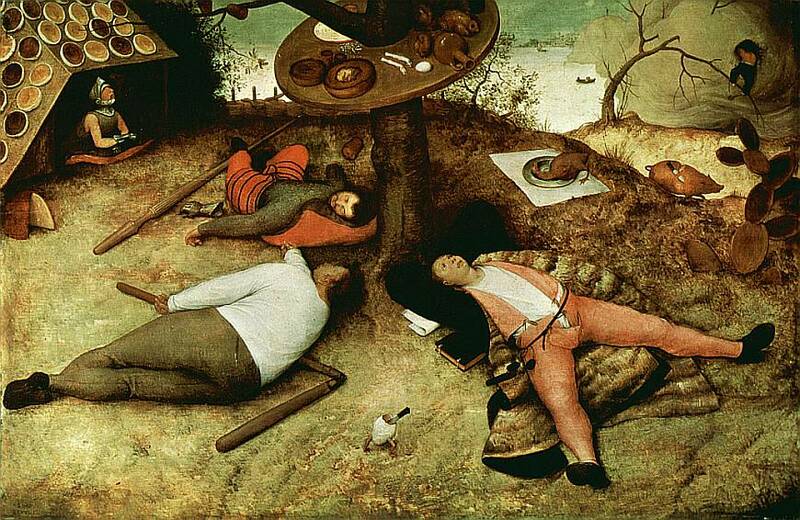 Brueghel suggests that for the ordinary person just having enough to eat and having their physical necessities met would have been heaven indeed. Put this in context of the fact that in our world 2 billion people still live on less than £1 a day and hundreds of millions of children go to bed hungry each night. Here hell might be read as exclusion from the security and privileges of our western lifestyle, where the excluded are the new damned. So the question we started with in creating this show was: how would contemporary artists respond to this subject? In our secular culture, where there is no otherworldly accountability for our behaviour, where we expect our needs and even our wants to be met here and now, where the consumerist imperative leaves little room for postponement of desires, would the theme find any resonance at all? In the curators’ introduction to this exhibition, the question is raised as to how the age old artistic theme of heaven and hell might find any resonance “in our secular culture, where there is no otherworldly accountability for our behaviour, where we expect our needs and even our wants to be met here and now [and] where the consumerist imperative leaves little room for postponement of desires.” Leaving the overarching question of how to the artists themselves, I shall consider here two component questions, namely What has taken the place of traditional religion in contemporary society, and how might this influence our understanding of heaven and hell? and Who, in the place of “God”, is the judge? Stephen Hawking recently gibed that science has killed philosophy, but, as postmodern sociologist of science Steve Fuller points out, science, politics and religion were originally all related branches of one and the same search for and love of knowledge and wisdom – aka philosophy (1). The scientific method was developed in the 17th century by philosophers who were dissatisfied with settling for plausibility over factuality. These days, however, the disciplines have diverged such that they are seen to be almost wholly incompatible with one another, and, in many cases, even to cause wars. Religion battles religion; religion battles politics; and religion battles science. Freud argues that religion, and the belief in an afterlife, is nothing more than man’s attempt to alleviate his fear of death and nothingness. But, things are no longer so black and white, since human “progress” has rendered us able to intervene into this crossing between life and death, with modern medicine able not only to prolong life artificially, but also to bring people back from the dead. Science has, in this sense, superseded religion. Doctors are often thought of as gods, following the Galenic tradition whereby nature is seen to cause disease, and the doctor is the hero who steps in to bring about a cure. But they cannot cure everything. And, especially in the case of mental health, it is not they who effect the cure anyhow. They may well help, and guide patients in times when they cannot guide themselves, but no one but the patients can bring about their own recovery. In the heaven and hell of the mind, it is each person who creates, experiences, and judges, and furthermore only he who can rescue himself. Illnesses develop because people feel they cannot live up to contemporary ideals. In a consumerist world where we expect our wants and needs to be met immediately, where celebrity status and superficial ideals hold sway, there is a proliferation of dissatisfaction; a scourge of disillusionment; an epidemic of breakdowns, eating disorders, depression and addictions. The more science “progresses”, and the more man can defer death and take on the role of the divine, the more hellish the potential of his own life becomes. The individual, ultimately, is the judge of his own life and deeds. In a cycle of never-ending, seemingly pointless suffering, a Sisyphian struggle, contemporary life can become hell on earth. “Would not a medieval European peasant,” the curators’ musings continue, “if she were to look at our brimming supermarkets, our hospitals and clinics, our clean cities and well fed children... would she not think that she was already in heaven?” Well, I would counter, is heaven really when we have all that we want and continually get our own way? Instinctively, many might think that it is, but, throughout tradition, stories have warned of those with power and privilege misusing it in this life, falling foul of hubris, and then being punished in hell in the next. Perhaps not too much has changed? Those who get too much of what they want today fall foul of their own increasingly insatiable hungers and are left perpetually dissatisfied and in a form of living purgatory or hell. Finally we come to the question of who, in the place of God, arbitrates as to what is good and bad? If each person is his or her own judge, how, coming back to the case at hand, are viewers meant to evaluate the art in this exhibition? How are works as diverse as video pieces (Nicca Iovinella and Suokwon Yoon), paper sculpture (Sher Christopher) and mixed media installation and collage (Edu Luna, Consuelo Celluzzi, Christopher Ward and Carlos Molina) to be considered alongside works from the more traditional schools of painting (Jamie Chapman, Robert Fitzmaurice, Annie Zamero and Trinidad Ball), sculpture (Lucretia Allan, Beth Gadd and Elspeth Penfold) and drawing (Julia Tester)? Grayson Perry touched upon this question in his recent series of Reith Lectures for BBC Radio 4 (2). He proposed a number of contemporary art world judges: the collector, the curator and the critic to name but a few. As Elspeth Penfold notes, however, relating to her collaborative installation piece, Cocoons, when it was previously installed in an exhibition at the Bussey Building, Peckham, it caused varyingly both discomfort and pleasure. This reinforces precisely the point already made. If there is no overall judge, or no established doctrine any more, who is to say what is right and wrong, good and bad? Each person is his or her own judge; each viewer must have his or her own individual response. The exhibition features twenty two artists representing many disciplines and from a variety of national backgrounds from Poland to Italy, Britain to Korea. Beth Gadd and Suok won Yoon have taken “the body” as the point of departure for their works. The female body under the gaze of our Barbie obsessed culture is the subject of Beth Gadd's work. There is an interesting question here about the viewer’s own role when judgements are made as to what is acceptable in the female body. Suok won Yoon's time-reversal video could be read as an allusion to the resurrection of the body. As we watch, time and entropy are reversed so that a viscerally dismembered corpse is resurrected in front of our eyes and made whole again. Many of the artists have found Heaven, Hell and even Purgatory in the psychological spaces of the human mind. In Annie Zamero's menacing figure, the warrior achieves greatness not in field of battle but in overcoming spiritual challenges; Carlosmol's delicate people (below left) expose their inner vulnerabilities to a world where hell can come from heaven and things may not be as they seem; Edu Luna's installation inspired by the story of Persephone’s journey into the underworld challenges the binary division between good and evil and invites one to consider whether visiting one’s own "dark side" may sometimes be the right route to personal liberation. Pawel Prus (right) invests landscapes with the quality of purgatory, winds and waves are stilled, light is bleached and perspective is shorn. There is everywhere a muted stillness that is waiting for something to happen. In his installation, Graham Johnston (left) uses the Kursk submarine disaster of 2000 to explore the mind state of men caught in limbo, subject to forces where they have no control, caught between life and death, hope and resignation. Nicca Iovinella explores the notion of hell as the inversion of "the peaceful place" by the forces unleashed by one's unconscious so that, as in Ovid’s Metamorphosis, what was a refuge becomes the scene of violent encounters. Some artists have found inspiration in the traditional iconography associated with the Christian Heaven and Hell and sought to engage with the tropes while stretching or subverting or recreating them. Eleanor Buffam's strikingly atmospheric and contorted self portrait (below right) using a photocopier could have come straight from the depictions of the damned in medieval art; Jamie Chapman's comic book style gleefully plays with exaggerated tropes of heaven and hell while presenting itself as an oil painting; Julia Tester's response to a rare 13th century mural in a Surrey church on the subject of heaven and hell which only came to light in the nineteenth century recapitulates the forgotten underground history of this subject in England since the reformation. Kate Hazell uses the conventions of Vanitas, symbolic works common in the 16th and 17th centuries, to illustrate the theme of heaven and hell explored in Dante's Divine Comedy. Sher Christopher explores the trivialisation of hell in contemporary culture by using the mundane frustrations of everyday life that pass for "Dante's inferno" in modern suburbia, while Robert Fitzmaurice brings us bang up to date by using polled responses to the question " who or what populates the orphaned spaces of Heaven and Hell today, when religion is considered by so many as an irrelevant and outmoded form of control" to generate his works. Taking the refugee's journey as its subject, Mary Knight's installation raises profound questions, both in its subject matter and the materials used, about who the "damned" are in our globalised world and how entry to “heaven” is gained and the compromised nature of the heaven when it is achieved. The stark contrasts in Trinidad Ball’s painting of a chalk white hand holding a bleeding red apple presents an ambiguous relationship between the holder and the held - Is the apple being held out for protection or delectation? Lucretia Allan's interactive work, on the lines of Monopoly, allows the players to negotiate their way into Heaven or Hell, while buying and selling souls to the Devil to further their own purpose. There is a suggestion that whereas the capitalist merely extracts surplus value from the workers, the diabolical figure of the banker is not satisfied till he has got the workers to barter their very souls. The traditional iconography associated with Heaven and Hell finds little resonance in the works of these artists, apart from in the desire by some to play with it or to subvert it. Heaven and Hell now function as metaphors, not for social control, but for personal liberation. In an age of therapeutics, the struggle for liberation happens principally in the mind, even if the subject is the shape of the body. The resurrection we seek is that of the healthy mind. Both the key to happiness and the source of unhappiness is within us. There is no single recipe for achieving heaven and no one really deserves hell. Some might argue that this focus on interior spaces points to the compromised nature of our society and culture. If we are already in heaven perhaps the best we can do is to improve it, rather than overthrow the established order. But then again, perhaps all is not lost. There are works in the exhibition which point to a way out of our culture’s self regard - through a genuine empathy with the outsider, the refugee and the misfit.